The Department of Natural Resources (DNR) has instituted an Abandoned Mine Openings (AMO) Remediation Program to address AMOs on Crown land. The program is managed jointly by the Mineral Resources and Regional Services branches of DNR. It is overseen by the Executive Directors of the Mineral Resources, Regional Services and Land Services Branches. The AMO Remediation Program is a long-term project, and approximately $50,000 worth of work is completed each year. A listing of AMO areas on Crown land has been prioritized and the work plan for each year is determined primarily on the basis of the priority listing. Other factors may be considered, such as newly discovered hazardous openings or fill settlement in previously remediated, high-priority openings. 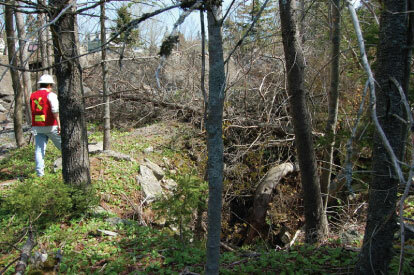 There are approximately 2,000 documented abandoned mine openings on Crown land in the province. These mine openings are spread across approximately 135 sites and each site may host anywhere from 1 AMO up to 250 (e.g. Montague Mines, Halifax County). AMO hazards range from extremely dangerous to no significant hazard. Most of the AMOs in the province (including those on private land) have been given a hazard rating, ranging from Type I (inescapable) to Type IV (no significant hazard). One of the main objectives of the AMO Remediation Program is to address all of the Type I AMOs on Crown land, and this was accomplished by the end of 2011. Over the past 11 years, 15 different contractors, as well as Department of Transportation & Infrastructure Renewal (TIR) crews have been involved with the remediation of not only all of the Type I hazards on Crown land, but also the remediation of approximately 550 other associated AMOs. The AMO Remediation Program began in 2001, and since that time approximately 650 AMOs on Crown land have been remediated. Methods for remediating AMOs include backfilling, fencing and placement of concrete caps over the mine opening. TIR plays a major role in the AMO Remediation Program, both in carrying out work with its own crews, and in tendering and managing contracted work. In the past 11 years TIR has backfilled more than 200 AMOs, capped four mine openings at Caribou Mines and New Ross, and assisted DNR staff in the placement of a grate to protect a bat habitat at Lake Charlotte. Besides the work conducted by TIR at Lake Charlotte, grates to provide access for bats have also been put in place at Glenelg and Londonderry. The Mineral Resources Branch conducts field programs to inspect almost all of the AMOs on Crown land on a regular basis. Operating on a three-year cycle, almost every AMO on Crown land in the province is inspected, and the degree of hazard assessed. Warning signs and flagging are upgraded as needed. Field inspections are used to update both the AMO Database and the AMO remediation priority list. In addition to the approximately 2,000 AMOs on Crown land, there are approximately 5,000 AMOs on private land in the province.